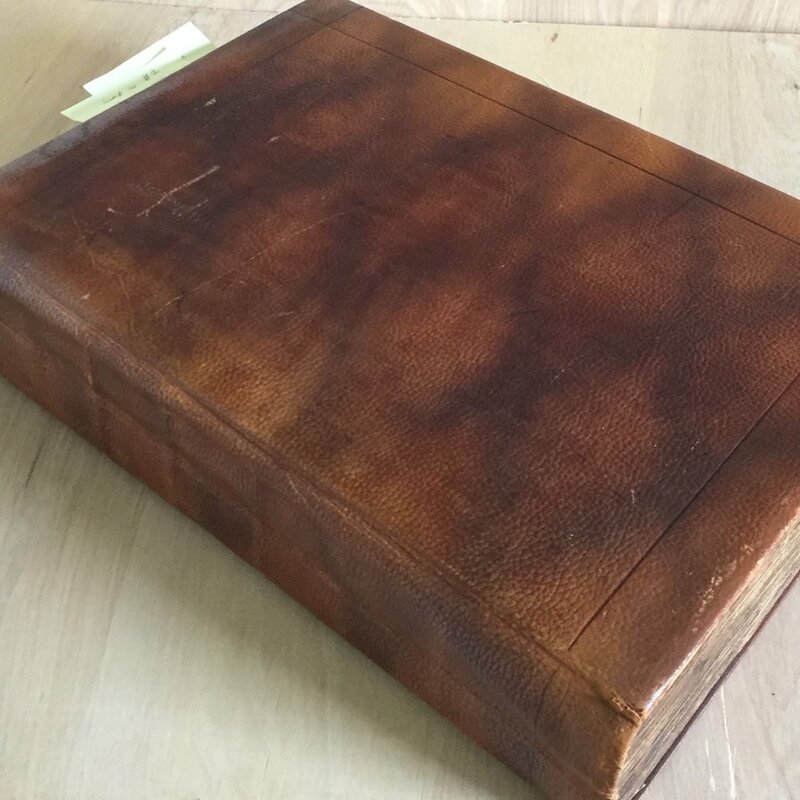 Crossing the Bench: 1617 KJV Bible Historical Rebind. We had the pleasure of restoring and rebinding this Holy Bible (KJV) from 1617, and it was such a fun project, and somewhat of a milestone as this was the first time I made brass corner bosses. I'm not usually a huge fan of books with corner bosses because of the thin brass used. I decided to use a thicker brass stock for my corner bosses, as I feel the hardware on large books should be proportional to the thicker boards and text blocks. I'm happy I made the decision to use a thicker brass stock, because the hardware looks fantastic! I treated the leather, dyed it, cosmetically aged it, and tooled the boards in both blind and gold tooling. I hand cut the brass for the claps and corner bosses, and engraved period appropriate designs in the metal. I embroidered a single bead end bands for the text block using lovely linen thread. All of this during huge storms, multiple tornadoes, and a two day blackout. Below are a few photos showing the process and finished binding.